Also I would like to say tack to Per Blomgren for proofreading the Swedish signals section. Intermediate signal Cst 320 to Stockholm Centralstation. The upper steady green says Line Clear, the blinking two greens say 'Expect 40 km/h at next signal. The rectangular number plate indicates this is a main or intermediate signal belonging to a station, block signals would have round plates. Below the number plate you see a shunting signal at clear (the two vertically arranged white lights). Dwarf main signal Cst 504 at stop for train movements (red) and also stop for shunting movements (two horizontal whites). 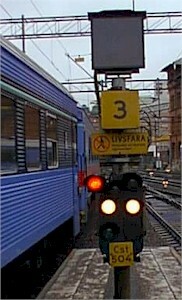 The square board with the "3" indicates that the departure governs track 3, sometimes also a board labelled "Gäller spår x" (applies to track x) is used. The indicator on top shows a flashing "A" to order the train to depart. It may also show T, L, or K with the meaning of the German brake test signals Zp6/7/8. The same signal as above showing a proceed aspect. The steady green at left means "clear with 40 km/h for train movements", the track beyond this signal is clear. The two whites mean "clear for shunting movements". Line closed sign at the end of a non-entry track. It is being phased out and replaced by stop boards or stoplights. "Stoplight" and the end of an entry track, similar to the usage of the Sh 2 on DBAG's lines. 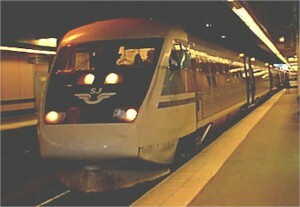 An X2000 at the Centralstation.